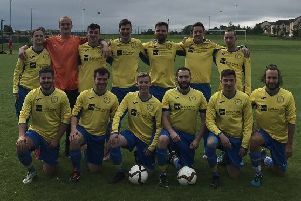 Sonny Swanson boosted Leith Athletic’s chances of a top five finish in East of Scotland Conference A with a hat-trick in their 4-0 win over Hawick Royal Albert – the only match to beat the big freeze. The mid-table clash at Peffermill 3G had to undergo three pitch inspections to get the go ahead and the hosts took full advantage as they moved up to sixth place to edge closer to the top five – those places in each of the three conferences forming a top league next season. Leith had lost three of their past four matches coming into this one with defeats by Dunbar United, Musselburgh Athletic and Arniston Rangers, and one win over Peebles Rovers. Swanson, who would later dedicate his treble to the late Shaun Woodburn on the former Bonnyrigg Rose defender’s birthday weekend, gave his side the lead on the stroke of half-time from a free-kick. Stefan Hay doubled their lead midway through the second half before two further Swanson strikes secured a valuable three points. Elsewhere, Dunbar United’s Conference A clash at home to Tweedmouth Rangers also looked set to survive the weather only to be called off less than an hour before kick-off by referee a John Stewart despite surviving an earlier pitch inspection at 11.30am. Dunbar United’s Twitter account reported that both managers wanted the game played and felt the pitch at New Countess Park was playable, but Stewart thought otherwise.